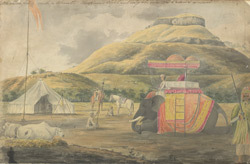 Water-colour painting of Chandor Fort with an elephant and tent in the foreground by John Johnson (c.1769-1846). This image is from a sketch-book of 36 drawings depicting scenes chiefly in West India and Mysore, c. 1795-1801. Chandor Fort is situated in Goa on the top of a high, flat, inaccessible summit. There was a fort on this site in the fourth century as attested by a copper plate inscription of a Bhoja King. As the tributaries of the Zuari River here are navigable Chandor (or Chandrapur) became an important trading port and was known to Arab traders as Sindabur, or Sandabur as early as the seventh century. The fort has had a turbulent history, it was captured by the Mughals in 1635, then passed to the Marathas. It was seized by Aurangzeb in 1665 then later extensively enlarged by Holkar of Indore in 1763. It was stormed by the British in 1804 and 1818.